We had some strong performances this weekend on the roads and the track. 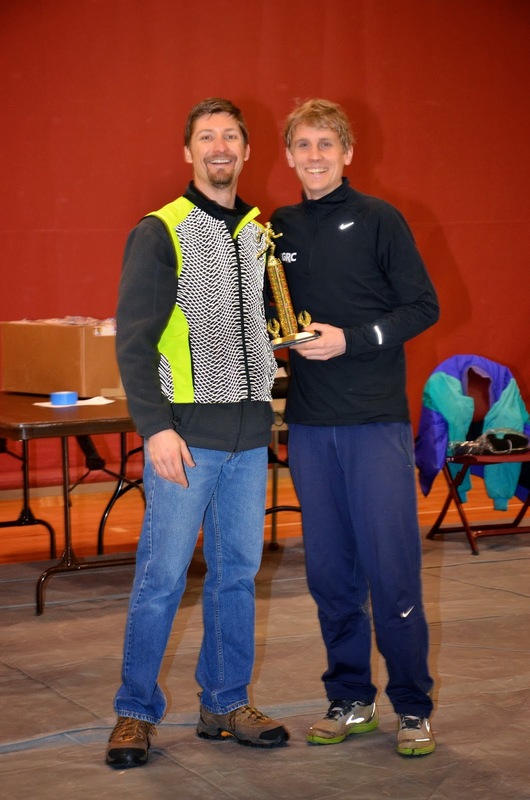 Fridge got the weekend started on the right foot on Saturday, winning Kirby's 5k by 45 seconds in 16:24, on a course that was altered for the worse by snow. It was mission accomplished at the RRCA 10 Miler, which we approached as a workout. The times were quite slow on the hilly course, but our crew got in the hard effort they were looking for. Luke got the win in 52:18, followed by Oregon Paul in 4th in 54:06, Evan in 8th in 54:44, Charlie in 9th in 55:05, Outlaw in 10th in 56:12, Murph and Dickson in 11th and 12th in 56:37, Lavar in 19th in 57:32, Breezy in 56th in 61:09, and Scott in 68th in 61:51. On the women's side, Teal made a successful return to racing after a lengthy absence due to injury, placing 4th in 63:49. Several members of this crew will be running marathons this spring, while others will be sticking to the roads. For all of them, it was a good start to what promises to be a great season. On the track, Mike made a triumphant return to Princeton, winning the 3000 in 8:26.7, the third fastest time in GRC history. Mike will surely threaten multiple club records this spring. Witty ran the 800-mile double, finishing fourth in the mile in 4:22, and after a seeding snafu, winning the slow heat of the 800 in 1:58.3, despite having to dodge traffic the first 400. Witty will be ready to run much, much faster outdoors. On the women's side, Tina made a successful 3000 debut, finishing third in 10:25.4, which puts her 5th on the GRC all time list. With some experience at this distance, Tina will be a force to be reckoned with. Susan finished 4th in 10:32 after taking a nasty spill 1200 meters into the race. Susan's indoor results have not been indicative of her fitness, and she will be ready to threaten her PRs at 3k and 5k outdoors. Much as I hate to even contemplate the possibility, the latest forecast says there is a chance for light snow on Wednesday, which could impact practice Wednesday night. But being the eternal optimist, I am confident that we'll be able to get in the workout, even if conditions are not optimal, so plan to meet for the warmup at 6:30, and we'll get rolling at 7:15. Because most of you raced on Sunday, we'll do a maintenance workout on Wednesday, and come back on Saturday with some faster work. Mike Franklin ran 8:26.7 for the 3k win this afternoon in Princeton, the 3rd best time in GRC history. 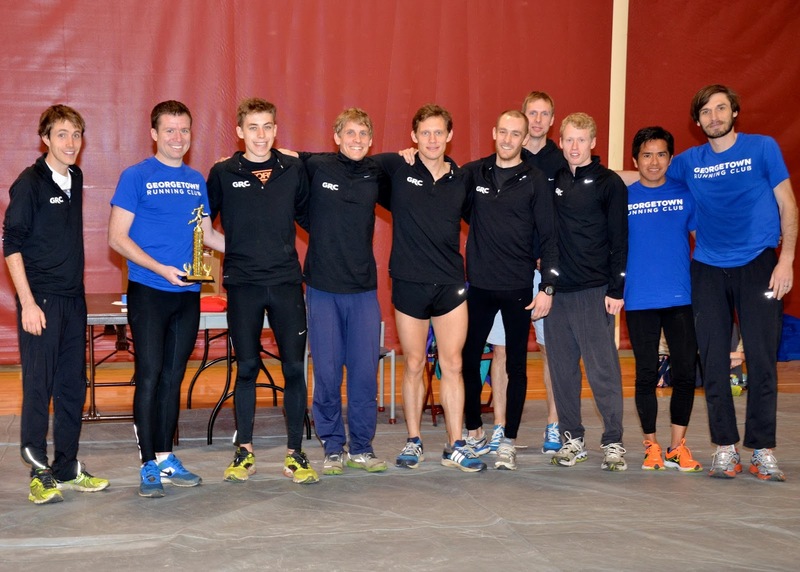 Meanwhile, in Columbia, Maryland, the GRC men took home two trophies in their first appearance at the touted RRCA Club Challenge 10 Miler: Men's Individual Winner (Luke Meyer in 52:18) and Men's Under 40 Team. The GRC men dominated the top 12 with 7 runners but needed 9 scorers for the Men's Overall Team title, falling to Falls Road by a single point. Because of persistent snowy conditions, we're moving the workout to THURSDAY at BCC. Full details are below. Please take a few minutes to enter your races on the team spreadsheet. I recognize that moving the workout to Thursday is less than ideal, but the track at BCC is still covered in ice and snow, and getting in a workout on the track, even if it's a day late, is preferable to the alternatives. Since the races are Sunday, the delay is feasible. We'll roll at 7:15 as normal, so meet for the warmup at 6:30. Most of the men will do 4 x mile with a 2:30 recovery, followed by 4 x 200. The targets for the A group will be 73s, 72s, 71s, 70s. The targets for the B group will be 77s, 76s, 75s, 74s. The idea on the 2s will be to run them comfortably hard, so I won't supply targets for those. We had some solid performances at the all-comers meet on Saturday, as Susan, Tina, and Heather went 1-2-3 in the mile in 5:15-ish, 5:16-ish, and 5:17-ish, and Tex Paul and JR went 1-2 in the mile in 4:27-ish, and 4:29-ish. The times are unfortunately unofficial. This group will be back in action indoors, and we'll surely see more excellent results. Our long national nightmare is over--the track at BCC is clear, and we'll be back in action at 7:15 on Wednesday (so meet for the warmup at 6:30). Most of the men will do 3 x mile, 4 x 800, all with a 2:30 recovery. The targets for the A group will be 74s, 73s, 72s on the miles, and 69s, 68s, 67s, 66s on the 8s. The targets for the B group will be 78s, 77s, 76s on the miles, and 73s, 72s, 71s, 70s on the 8s. As always, we can modify this as needed.